you find the best course of care for your loved one. Unlike other hospitals, we encourage visitors at any time – human as well as pets. People who wish to stay overnight may do so in the patient’s room or in several rooms on the premises – at no charge. We understand that when a loved one is near the end of life, making it easy for family and friends to visit and be present is a simple yet important thing to offer. What is the difference in palliative care and hospice? Where can you receive it? Is Hospice care right for you or your loved one? Hospice care is end-of-life care. The goal of the care is to help people who are dying have peace, comfort, and dignity. Calvary Hospital Hospice is a Medicare-certified Hospice program, which provides an interdisciplinary care team for patients with a terminal prognosis for all end-stage diseases. Hospice provides palliative medical care, treating the physical, emotional and spiritual pain of the patient and family. Hospice treats the patient and loved ones together as a whole unit of care and offers bereavement counseling for surviving caregivers after the patient’s death. 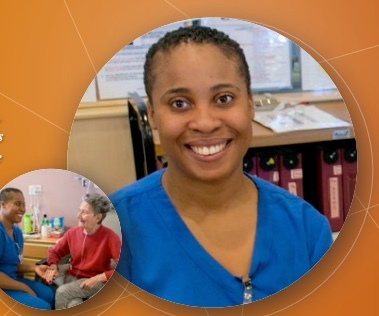 Our Hospice program features a dedicated team of registered nurses (RN), doctors, Social Workers, Pastoral Care staff members, Home Health Aides, volunteers, and bereavement counselors. Palliative medicine is a medical subspecialty provided by doctors who offer palliative care for people who are seriously ill. Palliative care relieves suffering and improves quality of life for people of any age and at any stage in a serious illness, whether that illness is curable, chronic, or life-threatening. Palliative care is whole-person care that relieves symptoms of a disease or disorder, whether or not it can be cured. Hospice is a specific type of palliative care for people who likely have 6 months or less to live. In other words, hospice care is always palliative, but not all palliative care is hospice care. Calvary’s Hospice services are designed mainly for patients who want to spend last days at home. Hospice patients remain in the familiar, comforting surroundings of home, whether it’s a private residence, nursing home, hospital or an assisted living facility. We now offer short-term inpatient care at The Dawn Greene Hospice in Manhattan and Ozanam Hall of Queens nursing home. Click here to view the Dawn Greene Hospice brochure. Click here to view the Calvary Hospice brochure. 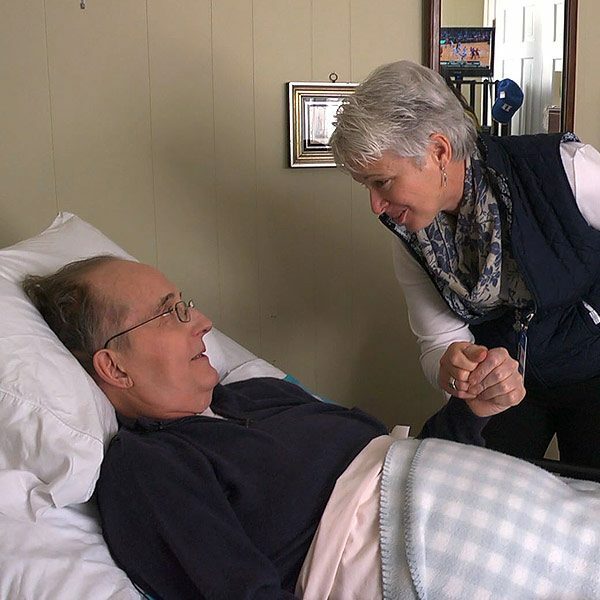 Hospice care provides the following four levels of care: routine care, general inpatient care (if needed), continuous care (during a crisis), and respite care. Is Calvary@Home right for you or your loved one? Calvary@Home partners with patients’ families to promote the quality of life, address pain management and other symptoms, and help prepare both the patient and their loved ones for what to expect in the final days of life. Calvary@Home is comprised of home care, hospice, and nursing home hospice. This umbrella group enables us to offer comprehensive care to patients who are suffering not only from advanced cancer but also from other chronic and acute terminal illnesses, and who are at home. Calvary strives to assemble a core group of permanent staff to serve as providers for each patient, creating a continuity of service for both patients and families. Today, Calvary offers home care in all five boroughs, as well as Westchester, Rockland and Putnam counties. It offers hospice services in the Bronx, Brooklyn, Queens, Manhattan, as well as Nassau, Westchester, and Rockland Counties – which includes more than 30 nursing facilities. 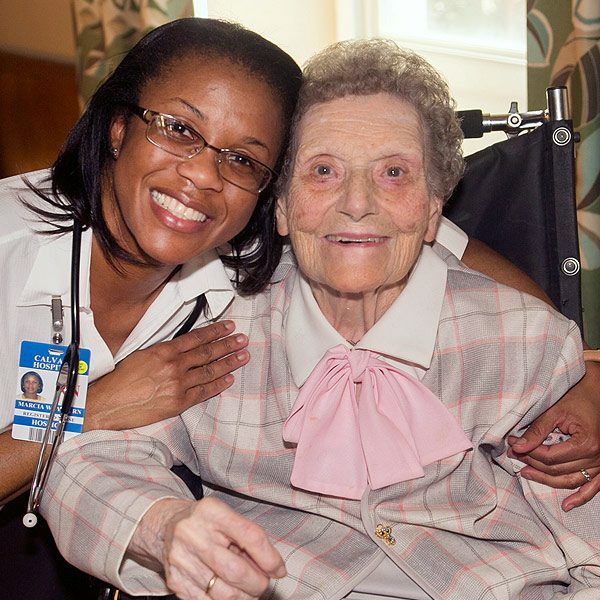 We offer short-term inpatient care at The Dawn Greene Hospice in Manhattan and Ozanam Hall of Queens nursing home. Individuals with a terminal prognosis. What is Nursing Home Hospice? Is Nursing Home Hospice right for you or your loved one? Calvary’s Nursing Home Hospice increases access to comprehensive hospice care and provides appropriate care to nursing home residents who are in the final stage of life, with the goal of bringing our comprehensive end-of-life care to residents. Brooklyn, Manhattan, Queens, the Bronx, and Westchester, Rockland and Nassau counties. Nursing home residents with a prognosis of six months or less to live, as determined by a physician. Most members of this group are elderly men and women (age 65 and over) who suffer from a wide variety of illnesses, with the most prevalent being dementia, and also including end-stage heart disease, liver failure, cancer, and emphysema. Is Calvary Hospital right for you or your loved one? 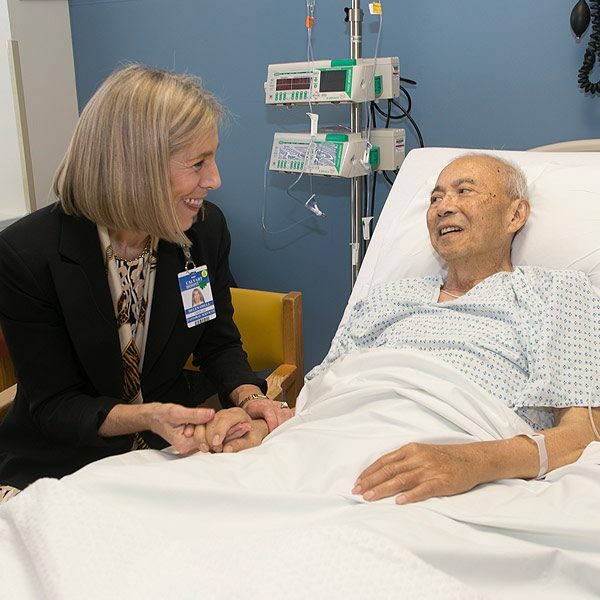 Calvary Hospital is the nation’s only fully accredited acute care specialty hospital singularly devoted to providing palliative care to adult, patients with advanced cancer and other life-limiting illnesses. Our patients come from across the New York tri-state area: the Bronx, Queens, Manhattan Westchester, Brooklyn, and Long Island as well as from other locations. They range in age from 20 to 108. Our patients all have a prognosis of six months or less to live, as determined by a physician. Unsure which CalvaryCareSM option is right for you? A CalvaryCareSM expert is standing by to help you assess your particular situation and the personal needs of your family or loved one. Please tell us a little about your needs. Our core principles of compassion, dignity, love, non-abandonment are human rights. My goal is to make every one of my patients feel like they’re the most important person.